Simplified connections, reliable communication and a rugged design! The GX1850G from Standard Horizon is a top contender in on the water communication. Built to IPX8 standards (Submersible to 5 Ft for 30mins) this 25W Fixed Mount VHF with Internal GPS is a must have. 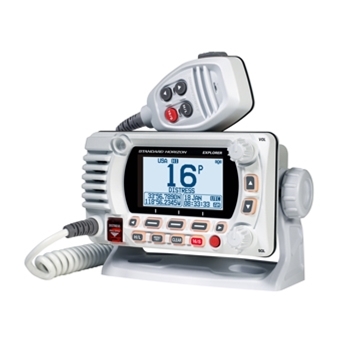 Available in white or black, the GX1850 G includes a 66 channel internal GPS receiver for GPS position and waypoint navigation, Class D DSC (Digital Selective Calling) which allows continuous monitoring of DSC functions on channel 70 while also receiving calls on other channels, NMEA 2000 connectivity for simple plug and play interface allowing connectivity of additional NMEA Data and so much more! A large DOT Matrix display makes viewing information such as GPS coordinates, channel, date and time a breeze. Plus the E2O (Easy to operate) Icon and menu system offers you the ability to store up to 10 favorite channels via preset keys. It is even second station capable via the optional RAM4 mic (sold separately). Simply mount the RAM4 in another location and you can remotely control all radio and DSC functions away from your GX1850G! Since Safety is one of the most important things while on the open water Standard Horizon ensured they have that covered. Class D DSC is included in every GX1850 with GPS. Class D DSC and distress functions can transmit a MAYDAY signal including vessel identification, lat/ lon and time in case of emergency. In addition you can automatically poll the GPS position of up to 4 ships using DSC. Also, since communication is the main purpose of this VHF and being heard is a crucial part of that, Standard Horizon kept that in mind when designing the Clear Voice Microphone. This microphone eliminates background noise and wind so you can clearly be heard especially in the event of an emergency. This microphone is also built with keys to quickly initiate an SOS call or to change screens on the GX1850G. 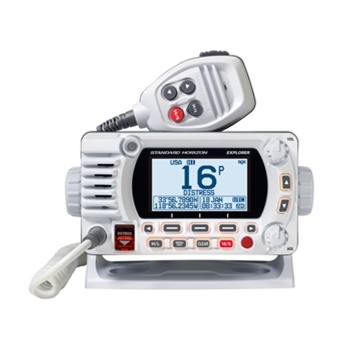 Whether you're on the water every day or just occasionally, the GX1850G is the radio for you. With a 3 year waterproof warranty, Standard Horizon stands behind their product for the first 3 years of ownership and will repair or replace your VHF for free without any haggle or hassle and if it fails after that time frame due to normal use, Standards Lifetime Flat Rate and customer loyalty program has you covered! Get out on the water, but be sure you have the GX1850G with you - providing reliable communication when you need it the most! Shakespeare 4187 Heavy Duty Stainless Steel 4 Way Ratchet Mount.